Today I have a fantastic business to tell you about. I was introduced to Word Décor 'n More when I shifted my jewelry business web hosting over to Shoppe Pro in 2008. In my own home, I love that my guests can "read" my walls. I'm a huge fan of word wall decor and especially liked the idea of a "welcome" quote on the front door of my house (and I'm still going to get that...just as soon as my door gets its' second coat of paint!). What I really love about the Word Décor 'n More website is they offer a photo gallery of inspiration. Just take a peek through the gallery and you're sure to find some ideas you'd love to put in your own home. Another great offering at Word Décor 'n More are their car decals. In fact, I had an idea for my car and that's when I personally "met" the owner, Andrea. She is super nice and provides some fantastic customer service! After many years of working in the corporate world, I decided to branch out on my own, and follow my lifelong dream of owning my own business. With a love for decorating, it was only natural to start a business that allowed me to express my creative side. After much research, I discovered vinyl lettering, and knew I had found my niche. With the loving support of my husband and family, Word Décor 'n More was launched. Vinyl lettering is economical, easy to apply, and yet, looks like many hours and much money was spent to achieve a personal, custom look. I am a firm believer of DREAMING BIG, then working hard to make those dreams come true! To that end, I find myself drawn to motivational quotes such as "WISH, HOPE, DREAM... then make it happen!". Personally, I'm a sucker for true love stories and I get to live one everyday with my husband. So when I saw this quote, "Always Kiss Me Goodnight", I just know I have to have it! From the beginning of my relationship with my husband, he would always say, no matter how mad, angry, tired or frustrated we might be at bedtime -'always kiss me goodnight'. Nearly, eleven years later, we always kiss goodnight. Well, that is, unless the dog decides she wants to kiss him goodnight first! I am very tied to the transplant community and what has been so great about meeting Andrea and being introduced to Word Décor 'n More is that, Andrea has offered a beautiful "Just Breathe..." quote for our guest post giveaway. I was immediately and personally touched by this quote. For that person who needs a lung transplant, they live every day with hope. Then when their day arrives and they receive their new lungs, it is truly a miracle. I believe when they wake up and take their first conscious breath of life, it must be so awe inspiring a feeling to "Just Breathe" -because you'll never live this moment again. To Enter: Visit the Word Décor 'n More (http://www.worddecor-n-more.com/) website and leave a comment below noting at least one of your favorite quotes from the shop. Thank you to Andrea for a giving us a glimpse into her business and for offering such a fantastic, inspirational quote for the blog contest. "Life is not measured by the breaths we take, but by the moments that take our breath away." is one of my favortie quotes. I recived a lung transplant nearly 10 years ago, and am still going strong, so I can't help but love this. Thank you for the inspiration. I looked at the different quotes, and my favorite is CHERISH yesterday, DREAM tomorrow, LIVE today. I'm a fan of Crystal Allure on FB. Thanks for the chance to win this great word decor! My favorite quote is, "Have I told you lately that I love you? " because this is something my husband (and caretaker) and I say to each other all the time! Thank you for the chance to win the "Breathe" quote. Having that grace my wall would enable me to easily talk about organ donation to anyone who comes by! 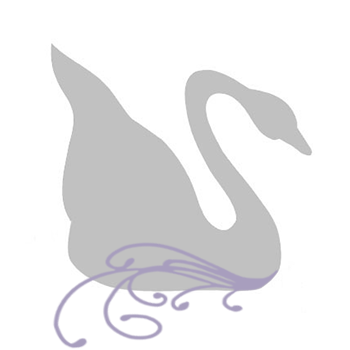 Hi, I'm a fan of Crystal Allure on Facebook!! Thanks for this chance :)! I've tweeted and commented on FB :)! So very, very true :)! ... forgot to mention ... I'm also following this blog :)! I love the breathe quote. I have the word breathe tattooed on my back. Im 6 months post transplant and loving life. Just Breathe...You'll never live this moment again. One of the best quotes. I also like the single initials. My granddaughter has been looking at this type of thing for her room, so I'll be showing her this website. Very nice!! I shared this on facebook ! My favorite quote is "LIFE isn't about waiting for the storm to pass... it's learning to DANCE in the rain...I really like this quote due to the fact I had a double lung transplant 9 years ago due to Cystic Fibrosis. With CF you can't just sit back and let life pass you by you have to jump in there and weather the storms and dance in the rain. 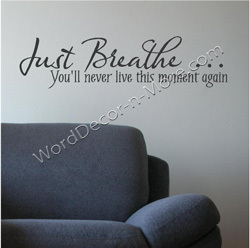 I am sooo excited at the chance to win the "Just Breathe" wall decor. That is awesome that you are doing this. Thank you so much! I am also going to start following this blog!!! Thank you to everyone for stopping by, learning about Word Decor n' More and for entering the giveaway. Stay tuned for more exciting news and giveaways!